to maintain them both at home and abroad"
Herbert Clark Hoover, 1874–1964. 31st President of the United States, 1929–1933. Speech typescript, four pages, boldly signed Herbert Hoover. With secretarial transmittal letter of provenance dated The Waldorf Astoria Towers, New York, New York, July 2, 1962. In this speech, entitled The Inheritance of the Next Generation, former President Hoover juxtaposes optimism for his student audience with ominous warnings of the Cold War. He would not "speak at the level of ʻbe good and you will be happy,ʼ" he said, but instead delivered "stronger stuff." Hoover spoke on June 27, 1961, less than three weeks after President John F. Kennedyʼs dismal summit meeting with Soviet Premier Nikita S. Khrushchev in Vienna on June 4. The United States and the Soviet Union were at odds over the divided city of Berlin and over American support of the failed Bay of Pigs invasion in Cuba. Kennedyʼs advisors worried that he misunderstood Khrushchevʼs determination to expand Communism throughout the world. At the meeting, Khrushchev largely bullied Kennedy, whom he saw as young and inexperienced. He took a tough stand on Berlin and berated Kennedy on a number of Cold War issues. Following the meetings, Kennedy told Time magazineʼs White House correspondent Hugh Sidey that he had “never met a man like that. . . . When I brought up the fact that if we let things get out of control and there was a nuclear exchange, 70 million people would die within 10 minutes, Khrushchev seemed not to care. He just looked at me." Kennedy candidly told New York Times reporter Scotty Reston that the experience had been “the worst thing in my life. He savaged me." 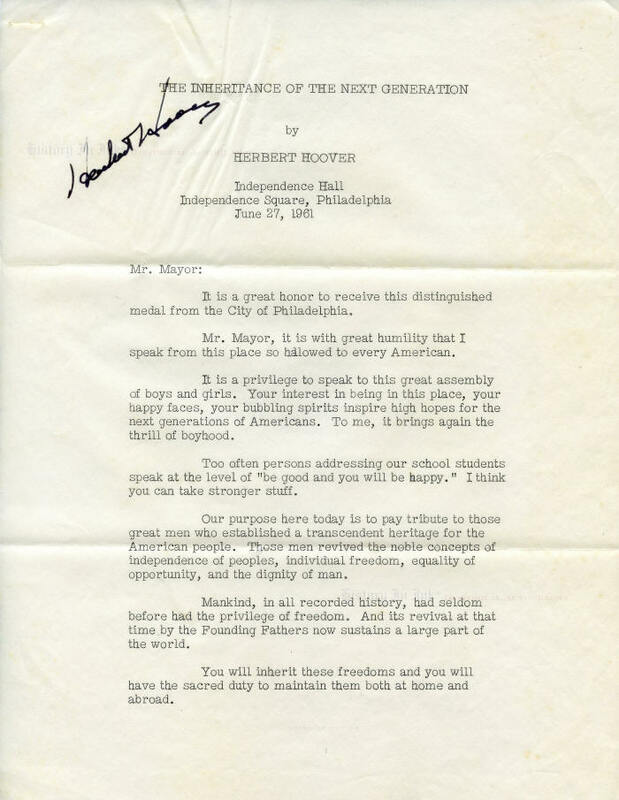 In this speech, delivered at Independence Hall in Philadelphia, Hoover spoke of the studentsʼ ”inheritance of freedom.” Freedom, he said, was not "an abstraction" but "a thing of the spirit" that "comes from love of our country" and "releases the energies and creative impulses of mankind." He paid "tribute to those great men who established a transcendent heritage for the American people,” those who "revived the noble concepts of independence of peoples, individual freedom, equality of opportunity, and the dignity of man." Mankind, in all recorded history, had seldom before had the privilege of freedom. And its revival at that time by the Founding Fathers now sustains a large part of the world. You will inherit these freedoms and you will have the sacred duty to maintain them both at home and abroad. To retain your inheritance of these rights, you will need not only to know what they are, but to be alert to protest any infraction of them. Today the validity of our beliefs in freedom is at stake on a global battleground. You will need take part in the struggle. You will inherit the costly burden of our defense against the implacable foe who lurks in the Kremlin. While we hope for the cooperation of other nations in this defense of mankind, in the end the safety of America must rest upon our own well-armed right arm whatever sacrifice this entails. I am confident of your courage. In my long life, I have lived and worked in countries of free men, of tyrants, of Socialists and of Communists. I have seen liberty die and tyranny rise. I have seen slavery again on the march. Every one of my homecomings was for me a reaffirmation of the glory of America. Each time my soul was washed by relief from the grinding poverty of many nations, by the greater kindliness and frankness which come from acceptance of equality and wide open opportunity to all who want a chance. I was inspired by the self-respect born alone of free men. There is no place on the whole earth, except here in America, where every boy and girl can have such a chance. This speech displays Hoover at his best. He was articulate and intelligent, but unfortunately his letters are almost always short and dull. Rarely do they contain anything philosophical. This speech, however, is quite the opposite. It is outstanding commentary by Hoover. The appears to be an original typescript of this speech. It is typed on white onion skin paper. The typing matches that which appears in the transmittal cover letter by which Hooverʼs secretary, Bernice Miller, sent it to a collector, which suggests that she typed it especially so that Hoover could use it to send his autograph. The speech comprises four typed pages. Hoover has boldly signed the first page at the top left in jet black fountain pen, which skipped a little as Hoover began the right leg of the "H" in “Herbert."  Each page has two normal horizontal mailing folds, a paperclip indentation and a bit of wrinkling at the top, and staple holes in the upper left corner. There are small paperclip stains at the tops of pages 3 and 4. Overall the piece is in fine condition. The cover letter, on Hooverʼs personal stationery, also has mailing folds and a similar paperclip impression and stains. It is also in fine condition. Click here to see more presidential autographs on the Presidents page.